What is the relation between race and class? and what do people mean when they say "class reductionism"? Questions of organising strategies relating to race and class have dominated leftist discourse in recent years. In this article, David I. Backer argues that we have to shift the focus of the debate about race and class reductionism to the the role of the relations of production. Recent debates among socialists often center around questions of class, specifically of class reductionism. Some people call activists and theorists “class reductionists” because they focus on universal “class” demands and they refuse to “confuse the issue” with “divisive” considerations of race or gender. These supposed class reductionists critique “bothandism”, a position taken by “identarian leftists”. The supposed class reductionists say that socialists shouldn’t focus on race and gender relations, but rather focus on “class” relations. But what is a class reductionist? That depends on your class analysis, or how you think about the relations of production that constitute class struggle itself. Relations of production are at the heart of Marxist theory. A relation of production is how people relate to one another and how they relate to non-human stuff as they make their lives together materially. Take a farm, for example. We don’t know the political economy of that farm unless we know the relations of production dominant there. Exploitative capitalist relations of production would have private ownership of the farm by a few and wage labor for the rest. Communal or cooperative relations of production would have ownership of the farm by the workers. Typically, Marxists want to change relations of production in a social formation from something like the former to something like the latter. But if you want to change a relation of production in some particular society, like the United States in 2018, you have to know all the ways those relations of production hold between people and their environments. To change a relation of production, you have to get at exactly what keeps that relation of production in place so you can derive the requisite strategy for getting people relating to one another materially in a different way. If you want to change the relations of production in the USA, you have to think of race as an integral, crucial, load-bearing feature of our relations of production. Treating it otherwise is just bad class analysis. A position that doesn’t do this couldn’t be class reductionism. That’s why the supposed class reductionists among us aren’t even class reductionists. When it comes to race and class reductionism, the question is whether all social relations are relations of production. A strong position here would be that all relations in a social formation are relations of production to some degree. Socialists who worked in the nexus between labor and the civil rights movement, particularly during Freedom Budget for all Americans project, took this strong position. David Roediger’s use of W.E.B Du Bois’s “wages of whiteness” in telling the history of racism in America is one example. While it may surprise some, Adolph Reed Jr.’s writings (which can differ from his current followers and even his own statements) have examples of the position. Keeanga Yamhatta-Taylor has called for this strong class analysis in her reading of Marx and Lenin in From #BlackLivesMatter to Black Liberation. Social reproductionists like Tithi Battacharya, Sue Ferguson and David McNally also take this route in their concept of unity in difference. Asad Haider has put forward insurgent universality for this purpose too. In each of these cases, the extent to which race has a determinate effect on access to jobs, pay, wealth/holdings, housing and access to services, is the extent to which race relations are relations of production. A weaker position would be that some relations, like race, aren’t relations of production at all. I’d disagree here and take the strong position, that each of those relations–while perhaps contingent and more complex across territories and social formations–are relations of production to the extent that they have an impact on whether/how people make their lives materially. These supposed class reductionists adhere to a kind of strict consensus that there are some social relations that aren't relations of production to any degree. This weaker thesis, which is, overall, a weaker class analysis, is a kind of separatist thesis on relations of production: that some social relations, like race, should be separate when thinking about relations of production. The unified thesis is much stronger class analysis. The norm of representation as embodiment of appropriate categories of identity gives private and nonprofit contractors an easy standard of legitimacy that collapses possible differences on policy issues and directions into vacant liberal proceduralism (having a “seat at the table”) and Victorian racialist mysticism (“reflecting the perspective of the X”). Debate over displacement for upscaling redevelopment is a case in point. In opting for a language of “gentrification,” opponents of displacement, often without intending to do so, cloud a simple, straightforward dynamic—public support of private developers’ pursuit of rent-intensifying redevelopment—with cultural implications that shift critique away from the issue of using public authority to engineer upward redistribution and impose hardship on relatively vulnerable residents. Instead, discussion of gentrification slides into objections about display of privilege, and lack of recognition or respect that, notwithstanding the moral outrage that accompanies them, accept the logic of rent-intensifying redevelopment as given and demand that newcomers acknowledge and honor aboriginal habitus and practices and that the “community” be involved in the processes of upgrading. culturalist discourse also opens opportunities for petty, and not so petty, entrepreneurship in the name of respect or recognition of the community, within the logic of neoliberalization. So here we’ve got a good case of relations of production: relations of housing production. We’ve also got a question about the role of “identity” in the fight against the ruling class to accumulate through dispossession via development. Reed’s position is that consideration of cultural practices, awareness of displays of privilege, and awareness of ways of life in the existing community all “slide” into complicity with the ruling class and “cloud” a simple and straightforward issue. Reed even disagrees with the term “gentrification” as a racial concept since, according to him, it signals this sliding and clouding of the simple issue. Using the schematic we’ve been working on here, let’s assume that all social relations are relations of production to some degree. This means the relations of housing production will be racial to some degree. In housing, the question that Reed asks us to think about–which is helpful!–is whether or not our concept of the gentry, or ruling class, should be “racial” as well as “distributive” (if you’re even on board with a distinction between the two): whether race relations should be considered as relations of production in the housing sector. The relations of housing production in Reed’s own city are thoroughly racial in character. Certainly Reed would never take issue with that point. The question is where that racialization occurs in our concept of class. Either race relations are in the process of gentrification itself, located in the relation of production, or external to it. 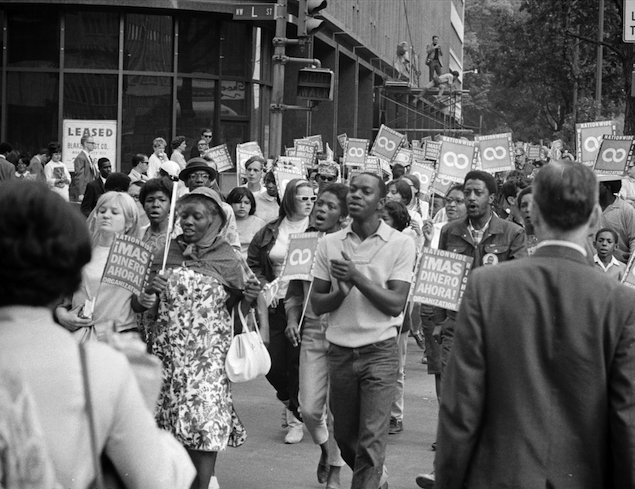 Dismissing race relations as “clouding” an otherwise simple issue of “upward distribution” is threatens to weaken the class analysis of the situation by separating out race relations from relations of production. More to the point, this theoretical separation is bad strategy: if we’re going to organize around dispossession and displacement in housing, we better take race relations seriously as we attempt to shift the relations of production, particularly given the outsized impact of white housing trends in traditionally black neighborhoods in the city. Demos did a national survey recently on effective race/class messaging for progressive and leftist groups, specifically around issue campaigns. A stronger, unified class analysis knows this is true. It’s almost insultingly obvious. Only a weaker, separatist class analysis would deny it. This weaker class analysis is supposedly class reductionism. But is it class reductionism? There’s a two-step process Reed and Chibber and others follow. First, this supposed class reductionist distinguishes race from class, creating a dichotomy between them such that there’s an either/or. Second, after distinguishing them, they suppose an essence/phenomena relationship between race and class. Race, and all of identity, is now “cultural” for instance: contingent and inessential to the more important matter at hand, which they say is class. Race becomes causally and politically subordinate to class. This is why the supposed class reductionists aren’t class reductionist: class reductionism is too kind a designation for what I understand this position to be. It’s just a bad class analysis to dichotomize “race” relations from “class” relations and then essentialize the latter as an underlying cause of the former's contingent, “rhetorical” phenomena. This is a weak, separatist concept of relations of production. To end on a practical note, not only is the separatist position bad class analysis, it can lead to bad class strategy and practice. On the left, our theories can inspire how we plan and behave in organizations. When we have conversations, listen to others, plan and participate in meetings, and generally do the work of changing relations of production, separating out certain social relations from our concept of class will make us blind and deaf and dumb to the actually existing complexity of the terrain on which we have to fight. The new separatists have influenced leaders in organizations like the Democratic Socialists of America and others. My hope with this essay, by shifting the focus of the debate about race and class reductionism today to relations of production, is one step towards keeping us on track to win the world we want. The author would like to thank participants in the DSA National Discussion Forums for engaging in debate around the above arguments. There’s a difference between Reed and Reedism. Throughout his career, Reed has been prolific on the subject of race, in many cases articulating subte and insightful positions on race and class. The ways his current work is taken up in mainstream debates however, and sometimes his own statements in public fora, are quite different than the more thoughtful positions you can find in the full breadth of his work.